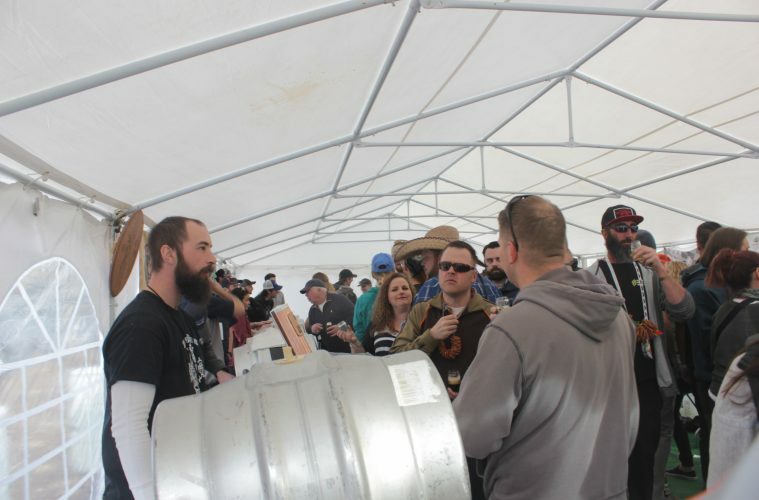 The 13th annual Firkin Rendezvous presented by Bristol Brewing Company took place last week, once again gathering together craft breweries throughout Colorado to celebrate the industry’s passion and long history of beer innovation. Now held at the brewery’s location at the Ivywood School in Colorado Springs, Colo,, this yearly event is a benefit for the Colorado Brewers Guild and showcase of the guild’s members. But the Firkin Rendezvous isn’t your typical beer festival. At this unique winter fest, beer drinkers will only find one thing: cask-conditioned beers. Originally popularized in the U.K. by pub owners who devoted themselves to the art of tending to cask styled ales, cask ales are traditionally fermented, dry hopped, conditioned and served all while in the same cask. The classic British firkin has become the best known contemporary cask, a 5.4 gallon vessel which nets you about 43 pints of beer. Breweries today approach casks with the same spirit of innovation that pervades the industry, but keeping the traditional style in mind. While historically the cask housed the entire process of fermentation, most breweries today use casks for a bit of experimentation. Brewers take the nearly finished, unfiltered beer, and cask-condition them with unique ingredients to give them a story all their own. This includes anything from hefty dry hopping to showcase an interesting hop, to adding ingredients that may be more at home in a bakery like cinnamon sticks, vanilla beans, and fresh fruit. The results of this traditionally-influenced experimentation are all over the board, and Bristol Brewing’s Firkin Rendezvous is the prime venue to try out some of the most innovative products of Colorado’s brewing culture. Check out our top 5 favorite firkins from the fest. Crooked Stave’s Nightmare on Brett Raspberry was definitely one of the most talked about beers I tried at the event. Owner and brewer, Chad Yakobson is nothing if not committed to his craft. This version of Nightmare on Brett starts out as a porter recipe, then travels between two of the breweries massive foeders, spending a few months in whiskey casks in between for good measure. The second term in a foeder is alongside a few hundred pounds of fresh raspberries, and the entire process takes between one and two years. Spontaneous fermentation with brettanomyces in the first foeder gives this ale flavors that are unmistakably from Crooked Stave and every bit of this adventure is showcased in the beer, from decadent raspberry richness to a subtle hint of smoke and wood. Great Divide’s Yeti Imperial Stout is a well-known favorite among the Colorado beer scene, but this version is a little hotter than the rest of its Yeti peers. The stout is spiked with ancho chile peppers and cinnamon sticks for level of heat that’s distinctly balanced between chili hotness and a dessert-like cinnamon spice. Vanilla is also in the mix to balance out the spices and accent the cinnamon. Coffee beer has fully broken out of its dark styled conventions with coffee IPAs proving popular with many recipes, and now coffee sour beers emerging in the craft beer industry. In this preview of an upcoming sour ale from Dry Dock, their Coquina Sour Blonde was augmented with both freshly roasted coffee beans and coconut. The tropical fruit notes were expected in this soured blonde, but the way that they intertwined with the light roast, iced coffee sweetness was not. The refreshing coffee flavors drop out as the beer finishes and coconut blends with the tartness for a refreshing cocktail-like smoothness. The most decadent of the standout firkin beers, Paradox Beer Company’s Café Cherished starts out as a barrel soured brown ale aged in red wine barrels. The sour brown is then cask conditioned with Ecuadorian cacao nibs, a mix of Sweet Stella and Tart Montgomery cherries, and coffee beans. The result is a deliciously dense beer that isn’t far from a tart cherry covered in dark chocolate. The least complicated of our firkin favorites, Ute Pass Brewing Company’s Black Cherry Porter is a beer that I could have enjoyed all day. The team at Ute Pass blended their porter and just the right amount of black cherries to make this simply awesome and sessionable Black Cherry Porter. While not as complex as the other featured firkins, this beer stood out from the crowd. As a hop head, my top five favorite beers from the fest definitely surprised me. While there were some stellar dry hopped casks, these featured beers stood out as the most interesting and tasty in the crowd. Honorable mentions go out Blue Spruce Brewing Company’s Thai Chili Lime IPA with muddled lime leaves, Bristol Brewing Company’s Cutie aged Clementine Sour IPA, Left Hand Brewing Company’s preview of Caribbean Queen Double IPA, Palisade Brewing Co.’s Gin Barrel IPA, and Ska Brewing’s Gose conditioned with tequila soaked cherries and oranges.